Ben is lucky to have a big brother and a big sister who dote on him. Now that Sabrina is away at camp, Max has been the sibling in charge, and he is owning it. He's taken to calling himself "The best big brother." Max, Ben and I were up at the crack of dawn the other day. 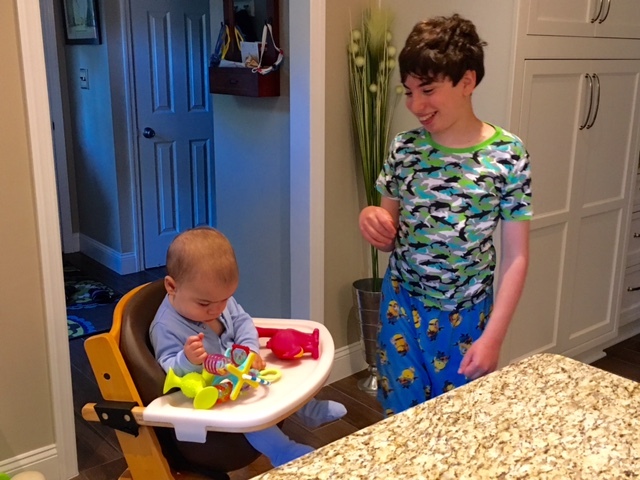 As usual, Ben had a bottle, hung out in the Jumperoo, ate breakfast, then chilled in the highchair. Max downed an oatmeal sundae consisting of oatmeal made with heavy cream, mashed banana and whipped cream on top. (No judgment, the doc says Max needs to gain weight). I made myself iced coffee while Ben and Max played. As Ben dropped his toys off the side of the chair (a charming new pastime), Max picked them up and said, "Nooooo, Baby Ben!" which didn't help. Still, it was cool to have Max practice grasping—that's me, always looking for the OT opps. 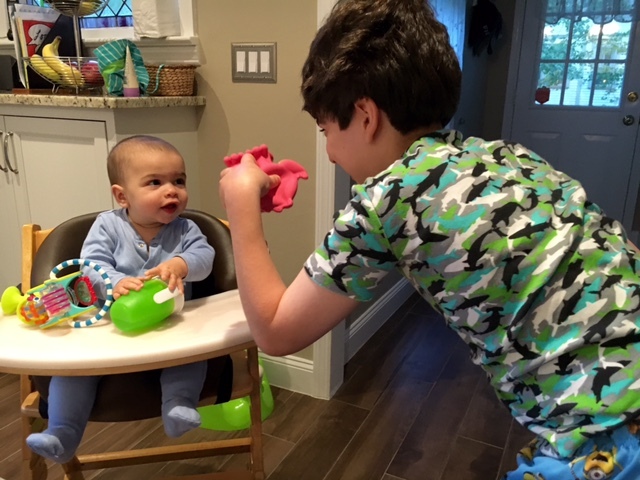 Even better, he grabbed Ben's pink dino and started squeezing it, excellent fine-motor skill practice. 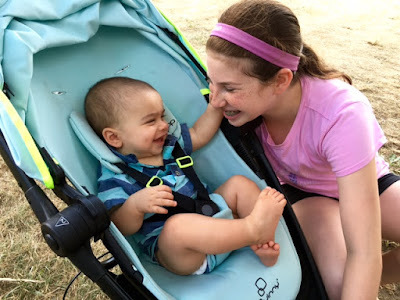 We sang the itsy-bitsy spider to Ben together (I'm always looking for speech opps, too). We played peek-a-boo, peering at Ben from behind the pantry cabinet door. 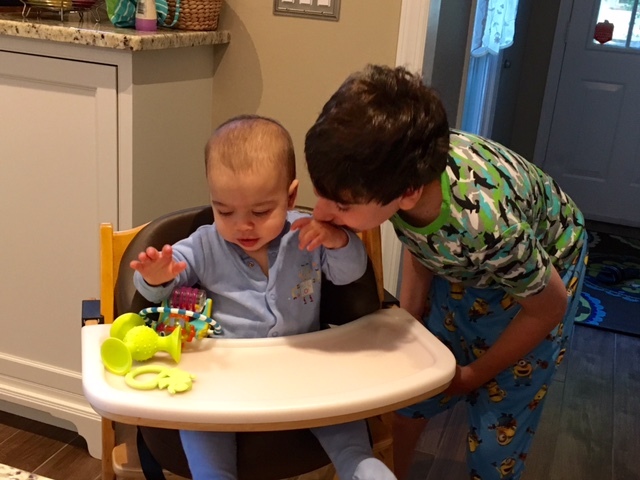 Max has always been an affectionate boy, and it's seriously sweet to see him loving on Ben. But I especially appreciate the confidence boost that taking care of Ben gives him. "I'm your big brother!" he regularly reminds Ben. And Ben knows it. 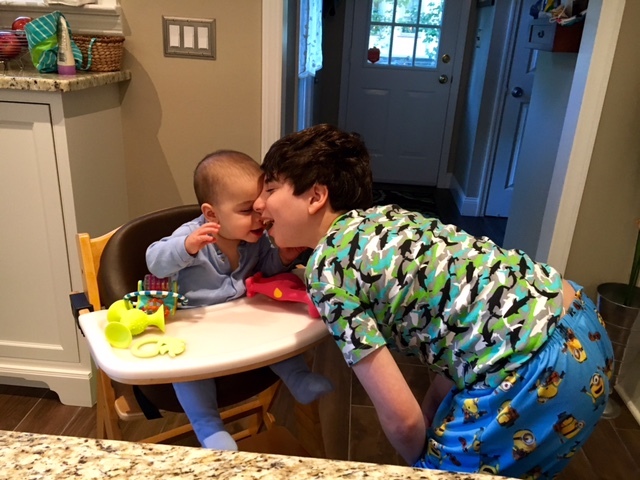 I love everything about this post - so glad they are forming such a nice bond - Max is a great big brother!!! Those photos are ADORABLE!!! And that oatmeal sundae sounds fantastic if you ask me. In fact, I need to gain weight myself (I'm thin and petite at 5'1") so I'm gonna have to try that!